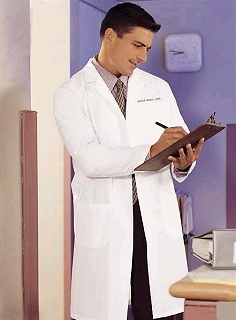 This is a full-length, heavyweight twill lab coat that is 100% sanforized (pre-shrunk) cotton from Fashion Seal Scrubs. White with cloth knot buttons and includes a two piece attached back belt with button closure. Other features include a left breast pocket, two lower outside pockets, and side slits for pant pocket access. Shop more of our products, including Cherokee Scrubs and Wonder Wink Scrubs, using the menu above.